Having a furnace that is not in good working order can make winter not only uncomfortable, but very dangerous. You should have your furnace cleaned and tested at least every-other year. Dust and debris can build up in your furnace reducing its performance and efficiency. In time, an uncleaned furnace could lead to the failure of internal parts and components. Be sure your furnace is clean, working, properly vented, and fitted with a new air filter. For many homes, the next line of defense against the cold winter weather is a fireplace. If you have a fireplace and plan to use it over the winter, be sure that you have cleaned out any ash and debris from the last time you used it. The Chimney Safety Institute of America recommends that you have your Chimney swept or cleaned once each year, or whenever there is a sooty buildup of 1/8″ or more. Creosote deposits form after repeated use of fireplaces and can lead to dangerous chimney fires that can spread to your home. In addition to cleaning, be sure that the chimney is free from obstructions and animals. Fall is a good time to prepare your stockpile of firewood for the winter. When getting your home ready for winter, you should check out how well your windows are preforming. Late fall is the prefect time to check that the windows of your home close and seal properly. Winter drafts will not only make you uncomfortable, they will make your furnace work harder and lead to higher heating bills. Replace or add rubber window seals where you can. You may want to replace old or under-performing windows altogether. 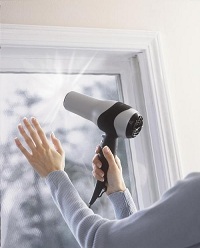 There are a wide variety of products available to seal your windows for the winter. Shrink-tight plastic sheeting is an excellent and economical way to seal off drafty windows for the winter. If you have exposed water pipes, or water pipes that run along the exterior of your home, you will want to insulate them with foam insulation wrap. Water pipes that are exposed in an unfinished basement or crawlspace should also be insulated to ensure they do not freeze and subsequently burst. Foam pipe insulation is readily available at just about any local home improvement center. The insulation is cheap and easy to install. 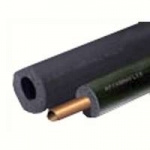 The insulation is tubular in shape and has a slit where you slide the insulation over the pipe. Installing requires cutting the insulation to fit and slipping it over the pipe (you may or may not have to secure the insulation with insulating tape depending on the location of your pipes). On extremely cold winter days, you may want to consider leaving a faucet running at a trickle as moving water is more difficult to freeze. Just because it often doesn’t rain during cold northern winters, that does not mean you should neglect to clean your gutters thoroughly before winter. Gutters clogged up with leaves and debris from the fall can easily lead to ice dams. Ice dams will not only add excessive weight to your gutters, potentially damaging them, but the can also lead to expensive roof and soffit damage. That last thing you want to be doing on a cold winter day is addressing roof damage that has lead to leaking inside your home. Be sure to clean out your gutters and downspouts while the weather is still reasonably comfortable. 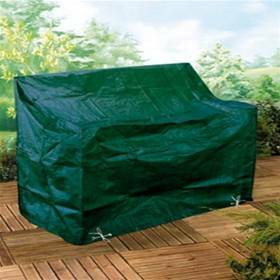 If you do not have a storage shed or room in the garage to store your patio furniture, grills, or other outdoor items, purchase some high-quality, all-weather tarps. You will want to spend a little extra money to get thick, strong tarps that will hold up to harsh winter conditions without leaking or tearing. Buy tarps that have eyelets so you can thread rope through the tarp to draw the tarp tight over whatever you are covering. Better yet, buy tarps that have the rope already threaded into the base of the tarp. Be sure the tarp is secure, you don’t want to be chasing your tarp down the street when strong winter winds blow. Rest some heavy-weighted rocks on top to ensure the tarp is secure and will not blow away (just be sure that the rocks are heavy enough that wind caught in the tarp will not heave them into a nearby window). 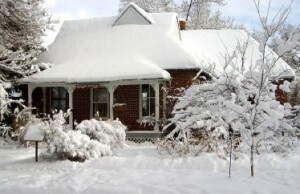 Take the time now, while the temperatures are decent, to winter ready your home. Keep your family safe and comfortable this winter by taking the necessary steps before winter sets in. Be safe and warm this winter!